Alright people, as promised the individual product reviews are coming/ have arrived. 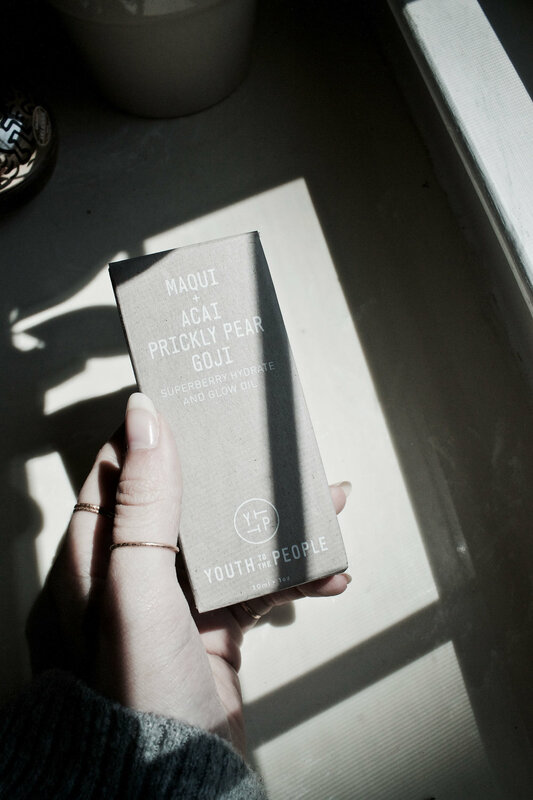 And to start off, we're talking about the newest star of my skincare routine: the Youth to the People Superberry Hydrate and Glow Oil (Maqui + Acai Prickly Pear Goji) also known as the longest name ever. I've been using this little angel for about three weeks now and I am loving it. MAQUI: A berry chock full of antioxidants, in fact it's the most antioxidant-rich fruit in nature! If you don't know, antioxidants fight free radicals which basically cause the skin to look aged. It's also anti-inflammatory and anti-bacterial. Truly a super berry. AÇAI: Also super rich in antioxidants, as well as omegas 3, 6, and 9. These omega fatty acids are basically building blocks for the skin. They reinforce skin's surface, making it looks smoother, increase hydration, and deliver even more antioxidants into the skin. PRICKLY PEAR: Full of Vitamin E (150% more than Argan Oil), high in antioxidants, and Vitamin K which brightens skin and reduces dark spots. Prickly Pear Oil is also full of amino acids which helps the skin produce more collagen, promotes skin-cell turnover, and is anti-aging. GOJI: Also high in amino acids and antioxidants, as well as Vitamin C which helps to firm the skin and reduce dark spots. Goji Berries also contain polysaccharides, which are mega priming and hydrating. SUNFLOWER/JOJOBA OIL BLEND: Ultra hydrating oils full of fatty acids and more antioxidants. The texture of these oils is very similar to that produced by your skin, meaning it's very easily and quickly absorbed. Youth to the People says; "This ultra enriched, flash absorbing face oil harnesses the nutrients of rare superberries. Maqui, the most antioxidant dense fruit in the world, is combined with açaí and goji, creating a potent antioxidant elixir. Intensely hydrating prickly pear and squalane oil lock in moisture with the help of omega fatty acids and high levels of vitamin C. Our perfected balance of jojoba and sunflower oil illuminate and revive dehydrated skin without weighing it down. Together, these super ingredients work in harmony to deliver a velvety soft, healthy glow." Not going to lie, I loved this right from the get go, so it has been a little difficult to step back and properly assess it. The first thing I noticed was how delicious this smells. It's not super strong, so don't worry if you're sensitive to fragrances, it just smells lightly earthy and fruity and like I kinda want to drink it (but don't do that, come on man have some common sense). I was also amazed at how lightweight it feels. I always kind of scoff at oils that claim that they're light because 99% of the time they aren't. Because they're oils. But my skin truly does soak this right up. If you don't like oils (why?!) you still probably won't like this because it definitely still leaves that 'oily' feeling, but it's super light feeling. The hydration factor of this lines right up with some of my other favourite oils, i.e. the Jordan Samuel Skin etOILe, but is absolutely something I could wear out during the day as it isn't as heavy. I personally am yet to notice any dark spots fading or tightening or anything like that yet, but my skin feels and looks much plumper and hydrated. This is also one that my nasty-dry-acne-scars soooooaks up and makes that flaky skin almost disappear (thank god). Also, I have gotten SO many compliments on my skin lately, so I have to think that something has changed that I just haven't noticed yet. Have you guys tried this beaut out yet? Let me know what you think!